For Labor Day weekend, Robin and I decided to escape and go camping. It was a last minute decision really, an impromptu trip so to speak. Friday was the last half work day that work was giving us (part of the new summer working hours they were trying out this year). We had discussed going camping earlier in the week but never really decided on anything for certain, but the idea was still buzzing in our heads. When I got home from work, we discussed it further. Kiddo was going to a friend's house for the weekend so we had to be around to take her over there after school (life of a teenager's parent = taxi driver). So we figured it wouldn't hurt to throw the tent and canopy in the back of the SUV, load Bug into her car seat, let our trusty side kick Clover hop in, and head out to Frozen Head State Park to see if we would even be lucky enough to secure a campsite. It was Labor Day weekend after all but with the remnants of Hurricane Issac threatening to drench the weekend here, we figured it was a toss up. Within the next hour, we were pitching the tent and setting up the canopy over the picnic table in our usual campsite, #17. A little while later we were dropping our payment for the evening in the pay-station tube and heading back to the house to pack the rest of our gear and to run Kiddo over to her friend's house for the weekend. Oh, I almost forgot to mention, we had another run in with the "Bathroom Nazi". Apparently it must be common practice for people to take over other people's campsites and gear while they are away?!? The "Bathroom Nazi", for whatever reason, thought we had moved in on another camper's site and were going to use their tent, you know because we make it a habit to reset someones tent when we find it laying around in an otherwise empty campsite. It didn't take long, thankfully, to convince her that it was our tent and that there wasn't anyone at this campsite when we pulled in. With that out of the way, the Bathroom Nazi decided to chit chat for a bit with Robin and to gush, as everyone does, over Bug. Of course who can blame her, Dinah is completely gush worthy. So after playing taxi driver for the teen, we were back at camp unloading our gear and getting the tent ready for sleeping in. It was already dark by the time we got back and we had to hurry to get everything set up so Bug could go to bed. 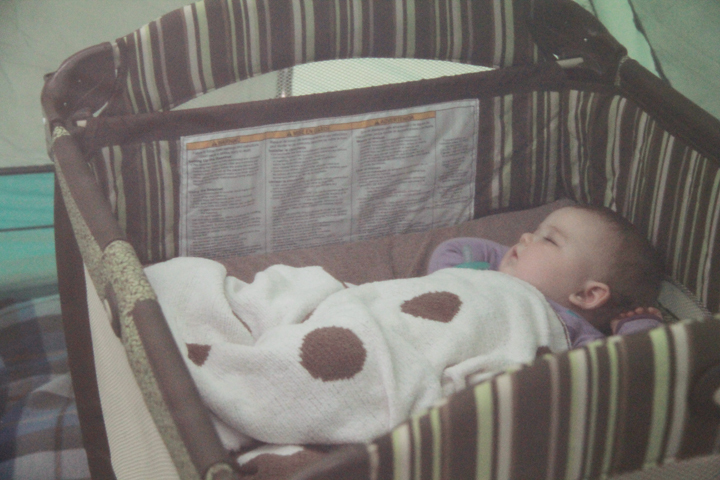 Doing all that and then getting Bug transferred to her Pack 'N Play posed to be a certain disaster waiting to happen. 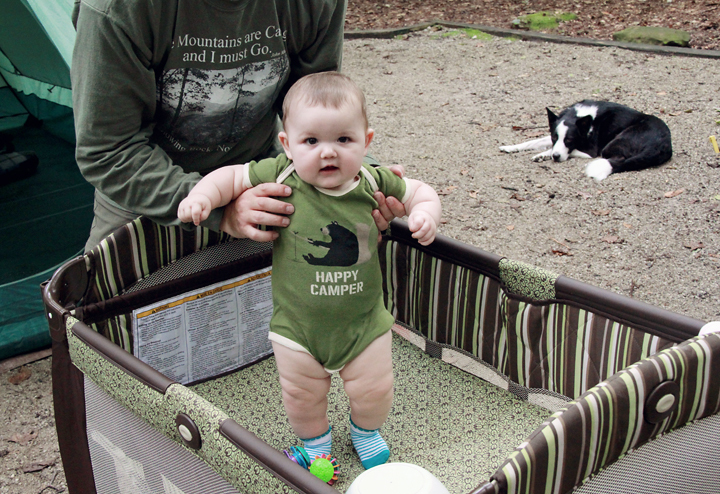 It was going to be her first time sleeping in a tent, in the great outdoors, so we weren't sure what to expect. It was, as we feared, a bit trying but we eventually triumphed and Bug was sleeping soundly in no time. It wasn't long and Robin and I were the last ones up in the campground, as usual. We finally went to bed sometime after 2am. The next morning we were all awake by 9am or so, it might have been a little earlier but who's keeping score anyway? 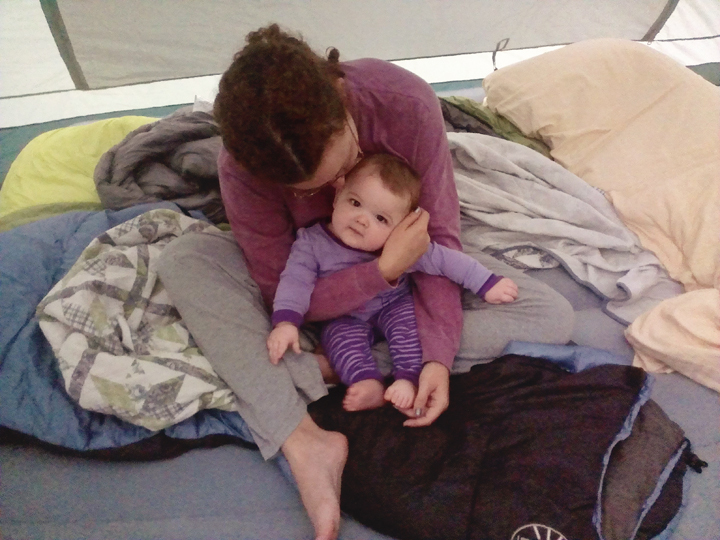 Bug had spent her first night in the tent in successful fashion, that's right another outdoorsy girl in the making. We eventually made our way out of the tent and started to get busy making ready for the day ahead of us. The first priority was a nice morning fire to sip coffee by. After that it was to brew said coffee. 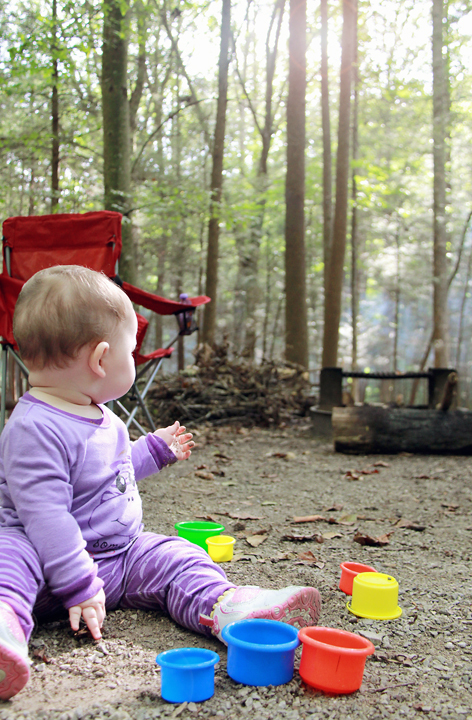 The camping trip wasn't just for relaxation, even though we got plenty of it. We also have a ton of gear that needs reviewing for this here blog and the trip gave us the opportunity to try out some of it. We brought a few pouches of Grower's Cup coffee and that's what we drank this first morning. Robin and I both had a cup of Honduran and Guatemalan roast. They were both very tasty but we'll expound more on that in an upcoming review. Of course we have our good blogger friend Brian Green to thank for the hook up on the coffee. Shortly after enjoying our coffee's it was time to relax a bit, after all Boo was getting over playing in her Elmo. 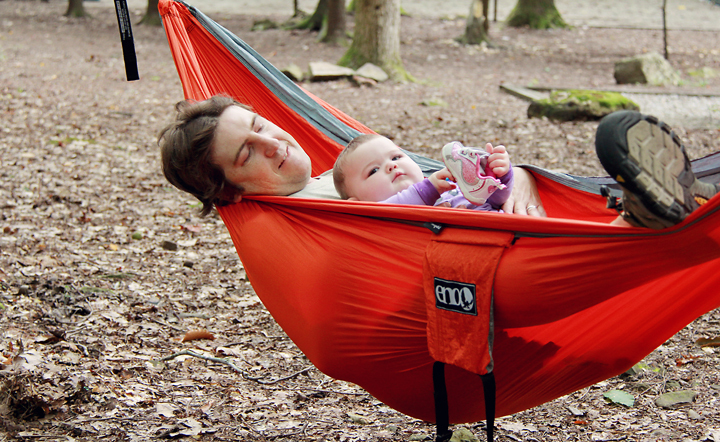 So I strung up our ENO Doublenest Hammock and Boo and I had a bit of fun laying, swinging, and bouncing in it. She also had the opportunity to enjoy a bobble while laying with Dada. It wasn't long before Boo was over the hammock though. 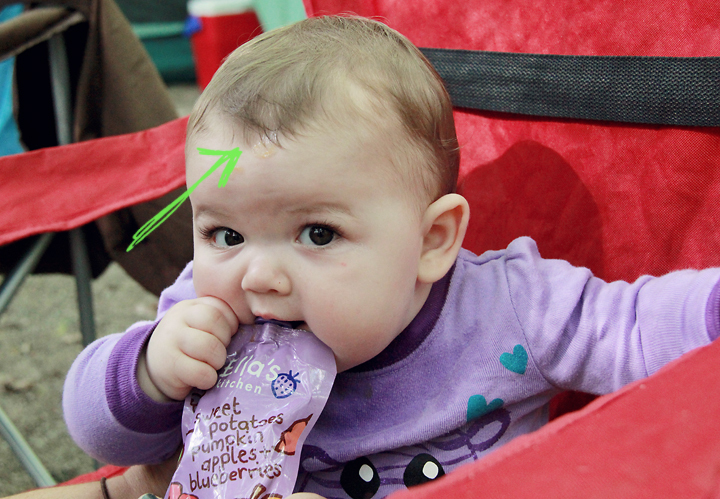 Like her Mama, Dinah has an inner chipmunk with a voracious need to constantly be doing something new, fun, and exciting. 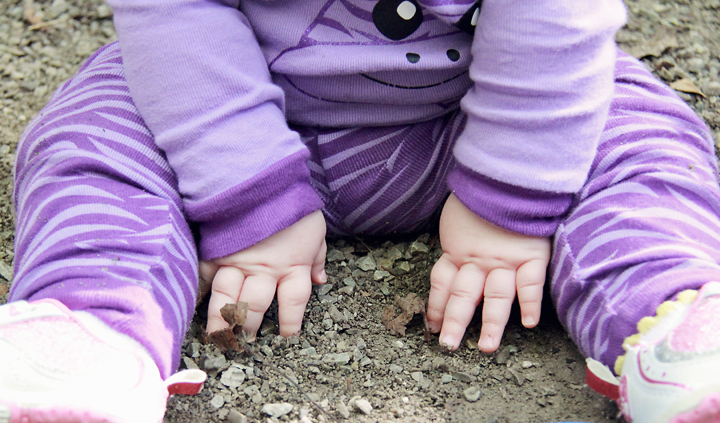 This led to sitting in the dirt and gravel, playing with toys, the dirt, leaves, rocks, and trying to taste test all of it. (A very common phrase these days - "Not in your mouth Dinah"). After playtime in the dirt was over, it was looking like rain. We confirmed it was going to rain in our vicinity and stowed away all of our gear and food. We decided that instead of waiting out the rain in the tent, we would drive out to town for some breakfast and then explore the area more. We drove around a bit and decided we'd explore some of the Obed Wild and Scenic River. We drove down to the Jett Bridge access, passing Lily Bridge Access. Here we got out for a few and let Boo get her feet wet in the river. She had a blast splashing her feet in the water. Afterwards, we went back into town and stopped at the store to get ice for the cooler and a couple snacks for the evening. We dropped all that stuff back off at camp and with more rain on the way, decided to drive back out for more exploration. This time around we drove to the Nemo Access at the head of the Obed Wild and Scenic River. It is here that the Obed Wild and Scenic River section of the Cumberland Trail's Northern terminus is located. Across the bridge from the Nemo Access is the Rock Creek campground. 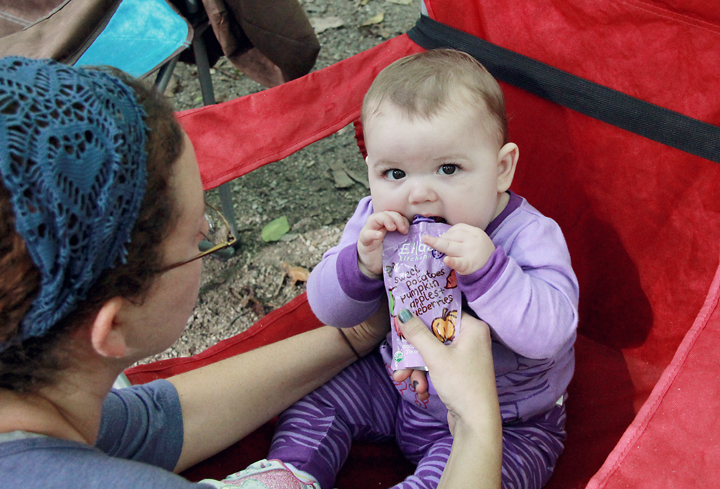 To our surprise, it is a very nice primitive campground located right on the river and only cost $7 per night to camp. Needless to say, we plan on camping here in the near future. After of our exploration was over, we headed back to camp for some lunch and then went for a nice stroll through the park. Robin had the photographer's itch and got some great shots of Dinah in front of a little storage cabin out front of the Visitor's Center. After the mini session with Boo, we headed back to camp to chill out until supper time. Boo got a little nap while Robin and I sat around passing the time. Before long night time was approaching and it was time to put Bug down for the night. 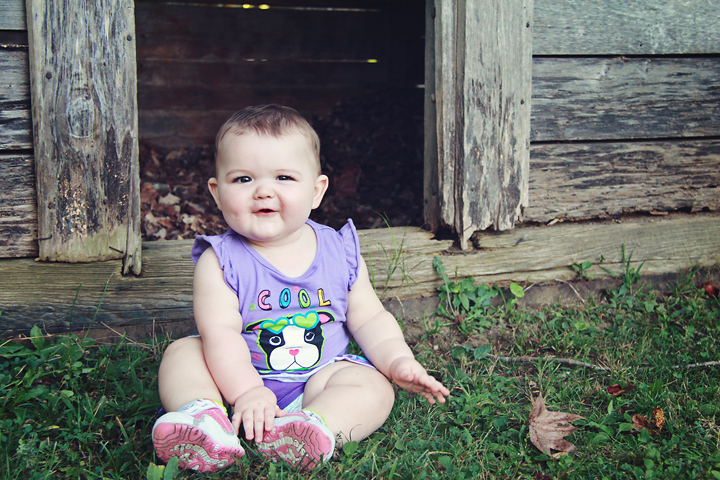 This was of course after she was up from her nap and spent ample time playing in her Elmo and in the dirt once again. Once she was down for the night, it was time to cook up some supper. I got busy cooking one of our Hungry Hiker meals, Chicken Pot Pie. We brought two of them but as it turned out, one was plenty for both Robin and I. I would imagine that if we had been out backpacking, then one wouldn't have been enough. We will likely review this meal more in depth later as we still have two packages under our cabinet. I will say that it was rather tasty. After supper, we spent the rest of the evening sitting in front of the fire relaxing, talking, and playing our own made up on the spot version of "Name That Tune". We had a great time with it and before long found ourselves tired and ready for bed. The next morning we awoke to find that it was even more overcast than the day before and rain was threatening to soak us again. So after a nice morning fire and a couple cups of Cafe2Go Self-Heating Beverage Kit - Coffee (another product we will be reviewing on the blog) we decided it was time to starting breaking camp and heading home. Bug had a great time playing in the dirt again while Robin and I packed up the vehicle and got ready to go. 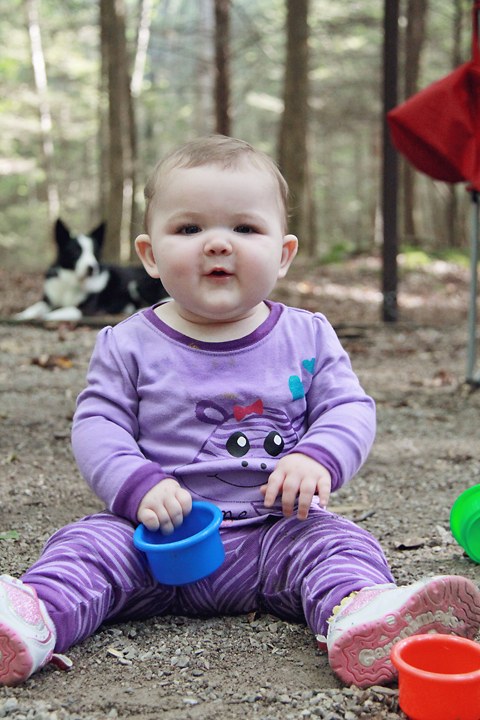 It was a great camping trip and I believe a wonderful first camping experience for Dinah. While she won't remember it other than through the pictures we took, we believe that the first experience will leave an impression on her for many years to come. 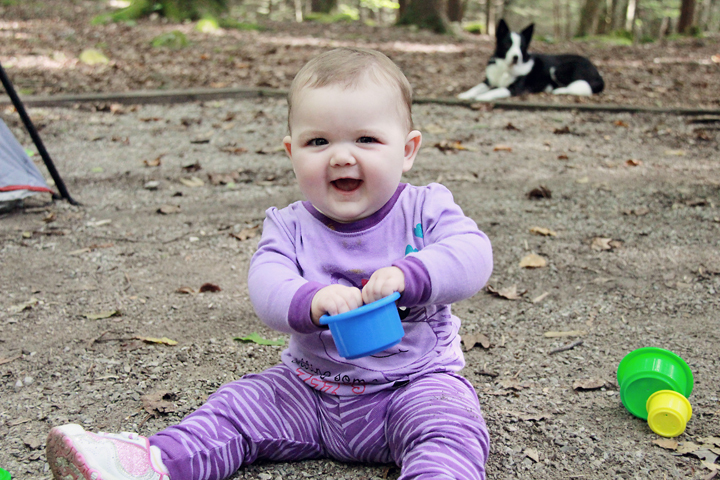 Besides, she always loves being outside and we try to expose her to our outdoor life as much as possible.